Hey Angelina, what are you doing in Bayer Animal Health? 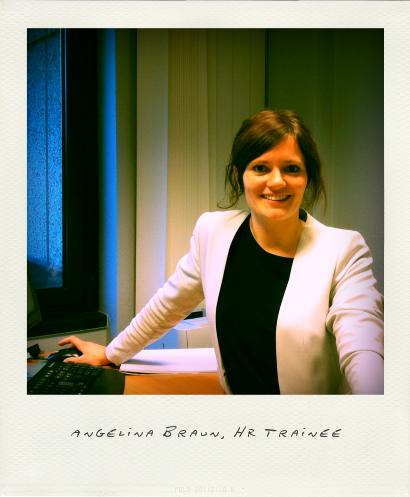 Within my HR Trainee program I have the chance to pass my Business Partner assignment with Animal Health supporting the HR team in Monheim. Being a Business Partner means bringing the needs of the business world in alignment with those Bayer business colleagues around the world. Working this way is dynamic, very exciting and challenging. Within our HR team I have the chance to learn from a very broad range of topics: from daily HR operative business, to strategic global HR topics. I was given responsibility almost immediately, which meant "diving-in-head-first," but this helped me grow into my role. At the beginning of February, I will leave AH and move to my next assignment in Singapore. Nevertheless the experiences, knowledge, connections and friendships I have made here will be an important companion within my further career development. What makes working @ Bayer Animal Health unique? I was really impressed by the openness and friendliness of the people here. Even the management team is very present and approachable. For example Dr. Dirk Ehle, President of the Animal Health division, has been known to pass by the kitchen for brief chats, while colleagues drink coffee. I really like that. What is also very special about Bayer's Animal Health division is that colleagues are very much encouraged to ask questions. If you bring in new, innovative ideas they are taken in serious consideration, and if feasible they will also be implemented.